What are the types of wheelchair and scooter lifts? 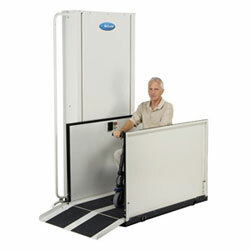 Vertical Platform Wheelchair/Scooter Lifts – are made for physical locations and are manufactured to assist individuals with physical disabilities from the ground to the main floor of their residence or business. Platform Wheelchair Lifts (Auto) – There are both solid and folding platform lifts that can be sub-categorized into automatic and semi-automatic types. An automatic lift will fold, unfold, lower and raise by operating a single switch. A semi-automatic lift requires manual folding and unfolding of the platform. 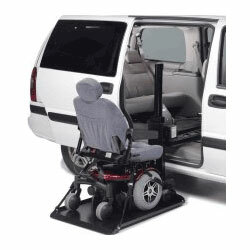 Rotary Wheelchair Lifts (Auto) – The rotary lift, sometimes called a “swing” lift, allows the scooter to be moved by swinging it inside, outside, and up-and-down. 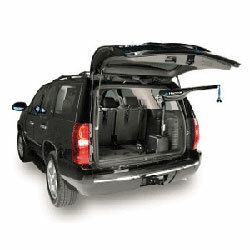 Normally used in vans and minivans but can be added to almost any vehicle trunk.